Fotos is a free iPhone app that catalogs your camera roll and albums and lets you add names to your images, making them easily searchable. It seems pretty basic, but Apple really doesn't allow you to name or rename images in the iOS version of iPhoto, which is a shame. "IMG_3561" just isn't that helpful. You can add some tags, but actually naming a photo appropriately is a really nice way to go. Launch the app and browse photos and albums. You can select them all at once or pick-and-choose. From there you can rename an image and browse its metadata, including where it was shot. Any changes you make in Fotos do not affect the originals. You can create new albums or collections within the app. To find a photo, just start typing its name and matches instantly appear. In addition, the app lets you share photos through the social sharing services or email. AirDrop is also supported. If you mail a photo from with the app the name you've assigned goes with it, rather than the arcane Apple name. The app is not hard to use, but you will want to explore a bit to make sure you understand all the options and what the icons mean. Oddly, sending an email is not from the same menu that sends your photo to social tools, but it has its own icon which seems needlessly confusing. Some people have complained you can't send photos via mail, but it is there. Just not where it would be expected. I saw a couple of crashes when using the app, so it will need a few bug fixes, but I'm sure that will happen. 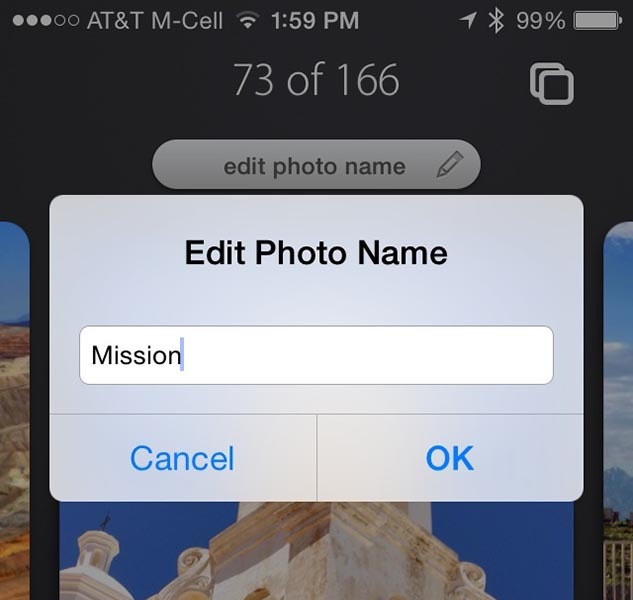 Still, the app allows you to manage your photos in a logical fashion and lets you name photos, which seems obvious but it's not something Apple has done. Fotos requires iOS 6 and it is not universal. It is optimized for the iPhone 5. I like the idea of this app, and with some small reliability enhancements and a slight clean-up of the GUI it will be a winner. Fotos for iOS does some things Apple left out originally appeared on Apple news, reviews and how-to's since 2004 on Mon, 12 May 2014 09:00:00 EST. Please see our terms for use of feeds.